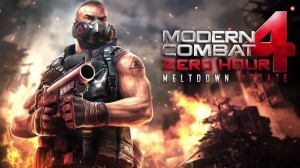 Most popular series of first person shooting game from gameloft “Modern combat 4 Zero hour” will be getting “meltdown update” that will enhance the gameplay with exclusive new maps from Antarctica & Barcelona. There will be tons of more new explosives awaiting for you to have an excellent combat with totally new modes and handling of excellent new weapons. Gameloft has released the sneak peak teaser video which will surely give you an idea what sort of updates you are going to get pretty soon in the form of Meltdown update. You can buy Modern Combat 4 Zero hour for your Android device over here. Watch out the video after the break.